To be creative and successful, designers and every creator should have lots of relevant experience. This is why attending professional design events would be very useful for creative growth. Where else can you see progressive technologies and cutting-edge ideas, if not on yearly exhibitions? There, designers receive the opportunity to see the new examples of products: furniture and lighting, which they usually only see in product catalogs. This is very important for developers, as they should be able to see, touch, and evaluate concept product themselves, since they always serve as intermediaries between manufacturers and clients. For example, it is much easier for a designer to recommend a new lamp after not only seeing it as a digital product visualization, but also talking to its manufacturer. So, what are the most important design events of 2016 in the US? Modernism Week is dedicated to mid-century architecture, interior and product ideas, the most notable examples of which belong to the years between 1930 and 1960. The event takes place in the Palm Springs area of Southern California, where you can see many examples of the architecture of this period. You can also attend a so-called ‘fall-preview’ of for the next year’s Modernism Week in October. New York Design Week is a celebration of creative that takes place all over the city. Moreover, most events are free of charge, which means that they are easily accessible for anyone! New York Design Week serves to create new business opportunities for each architect or product developer, to showcase new achievements in design and, certainly, to entertain the general public. The American Institute of Architects Convention is one of the largest and most significant events for US-based architects and developers. For non-US citizens, it can be a great opportunity to learn from over 800 exhibitors and to attend multiple seminars. However, if you happen to bring along a portfolio with digital product visualization of your designs, who knows? It can become a truly life-changing career event for you. The San Francisco Design Week takes place in the entire Bay Area, including the famous Silicon Valley. San Francisco is renowned for its cutting-edge innovations in the fields of technology and design – from small household equipment to cosmic-scale projects. Here, you can see the newest achievements in different businesses (technology development, architecture, product manufacture, etc. ), using them as inspirations for your own projects later or recommending new solutions to your clients. 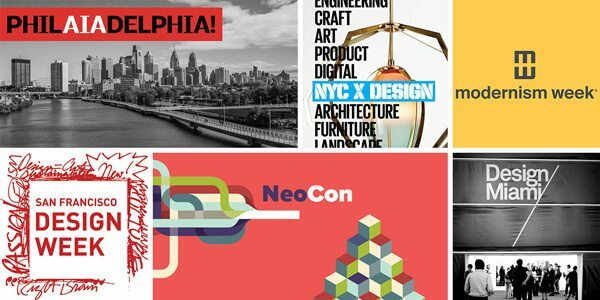 NeoCon is the largest interiors show in North America. The event lasts three days, featuring over 700 exhibitors and over 100 highly experienced speakers. Don’t miss the opportunity to bring your portfolio with you – showing the architectural or digital product visualization of your projects will not only allow sharing your creativity, but also receiving feedback from more experienced professionals in the field. Design Miami has become one of the most influential design shows in the world since its first event in 2005. It is attended by numerous creative talents who share their latest achievements and ideas. Moreover, its events now also take place in Bazel, Switzerland. Design Miami can become a source of endless inspiration for a talented creator, even if it only lasts for a few days. Developers who regularly attend professional events experience boosts of creativity much more often. Exhibitions provide great opportunities for learning about new directions and tendencies in design, seeing and touching new materials, appreciating new objects and thinking about how and where you can use your new knowledge on practice. This is where ideas are born. Many furniture manufacturers already use digital product visualization for creating catalogs, as architects use 3D visualization for presentation of their architectural projects to clients. 3D rendering is going to be the essential tool for each developer. You can receive enough inspiration for hundreds of projects, all of which can be turned into high-quality digital product visualization that will certainly impress old and new clients. Without such experiences, you can soon lose your grasp and unique vision, which are so necessary for a good designer. Thus, if you want to be a qualified, creative and highly demanded professional – stay in touch with modern tendencies, travel, observe, choose what you like and put it in your professional practice. Great tips, many people do not understand the power of 3d and it’s possibilities. What about design events in Europe?